Arts Nexus was formed in 1995 due to needs seen at the grass roots in the arts community and expressed as consistent priorities in a range of regional plans undertaken by all levels of government. The need remains consistent – for the region’s cultural expression to flourish in its own right to augment imported product, so enriching cultural life within the region and a sense of a distinct cultural identity to project outwards to share with visitors. To support the economic development of the region. A new era has begun …. Supporting cross-regional cultural strategies and initiatives. A partnership has formed with a local business based in Cairns and opened up stage one of the “Global Village” concept. A starting point to hold events, gather our membership and have street presence. Monday and Tuesdays 10am – 8pm with a full program of activities, training and member MeetUPs held at …..
new project funds – recommenced Nexus magazine from Aug.
provided groundwork, networking, regional travel and Arts Law w’shops for FNQ ATSI Unit project as offshoot of Craft Connect project that led to the Saltwater Collection. undertook FNQ Festivals survey, with insurance advice to Govt. Consumers or buyers, who also receive services to enjoy FNQ creativity, which supports the creative community. Formed in 1995 and incorporated in May 1996, Arts Nexus Inc was a response to implement the priorities of a Regional Economic Development Strategy for FNQ Arts and Culture initiated by State Development. 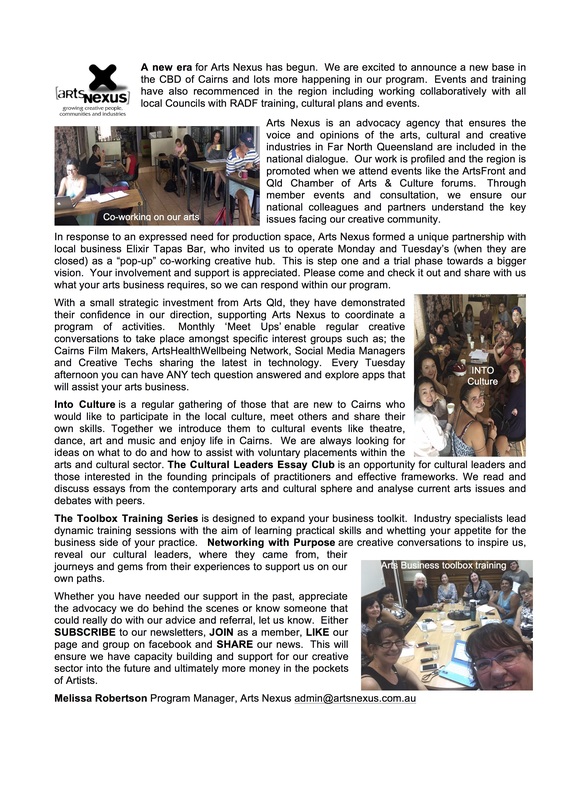 Arts Nexus was additionally responding to a range of prior cultural planning, all with compellingly consistent priorities for foundational development and support services based on the need for coordination, information access, networking, skills development, and collaborative promotion of FNQ culture. This was to support and retain creative producers and presenters in regional practice, to enrich the cultural life of the region, and over time to develop exports, nationally and internationally. The enduring objectives have been confirmed in Strategic Plans 1997-2000 and 2001-2004, and 2004 -2006, all determined through wide industry consultation. Although a Key annual organisation at the Australia Council for 6 years and one of only 7 currently listed in the Australia Council’s index of Resource Organisations under the Community Cultural Development heading nationally, only since 2004 has Arts Nexus been a triennial client of Arts Queensland, surviving until then with difficulty on as cocktail of one-off project grants. Through the early establishment of Arts Nexus magazine as its flagship coordination service, augmented by electronic systems, Arts Nexus has been instrumental in establishing a network of communications between artists and organisations within the region, and building a sense of dialogue and a connected arts community or sector, with strong links to the state and national support scene. In doing so, Arts Nexus has built the region-wide “cross-weave” to what were only vertical strands from the capital a decade ago. In meeting its charter, Arts Nexus now provides access to a broad range of practical development services – advice and information, coordination and networking, skills development in creative industry management, other relevant training and professional development, employment referral, project and event management, industry promotion, planning input and advocacy. Arts Nexus has largely done so by building relationships over many years, now firm partnerships, with a wide range of state agencies, overcoming their former ‘Burke and Wills’ expeditionary behaviour to the regions with a welcoming and facilitated ‘footprint’ provided into the region via Arts Nexus organising local logistics, including media and promotion, registrations, venues and hospitality for outside agencies to “bungee-jump” into the region within cost constraints. It’s seamless, cost-effective and efficient, delivering record audiences for partner programs through Arts Nexus extensive established sector networks, with more agencies signing up per year to work through this established and credible system. As a result of this cultural evolution, the FNQ region can be said to be in the third of three evolutionary phases, to which Arts Nexus has been both respondent and strategic leader. In Phase One or the “colonial outpost” era of the early 1990s when all services were in Brisbane and regions were merely audiences for touring product, regional cultural expression / production was fragmented and dismissed as amateur. It was not until 1995 that Cairns Regional Gallery was opened, with the Cairns campus of James Cook University built in the same year along with Arts Nexus building the first local arts database and initiating Arts Nexus magazine (still the only one of its kind in regional Australia) as joint-marketing to promote local expression alongside touring product. In the late 1990s this direct mail service was augmented by an e-mail newsletter (almost the first of its kind within the Queensland arts and cultural sector, grew to 1000+ subscribers). In 2000 the Arts Nexus website, with calendaring and other resources, cementing a ‘virtual’ way for Arts Nexus to deliver services in a region twice the area of Victoria, thus also beginning to address a tendency for ‘Cairns-centrism’. These innovations typify the priorities of this phase, directed at bringing otherwise isolated artists, performers and writers into dialogue to form a self-identified creative community across the region for the first time. Arts Nexus was also active in policy and planning circles cross-sector and at state and national levels, embeding culture into plans including the 2010 Regional Plan. Phase Two around 2002-2003 got serious about up-skilling the region’s creative producers, leading to the partnerships with relevant Statewide arts agencies, with Arts Nexus increasingly becoming the local agent for these state and national bodies to foray into FNQ. Arts Nexus mounted its own training in areas of perceived gaps, leading the first showcases of regional product to test markets within the Sydney Gift Fair and showcasing craft in Singapore twice under its craft development project, Craft Connect. 2004-2006 has been typified by consolidation as an annual Key Organisation from the Australia Council and gaining triennial funding from Arts Queensland for the first time, allowing the addition of programs providing more live engagement and interaction across the region. These include networking forums, an enhanced advice and referral service, auspices and mentoring, active facilitation of other FNQ organisations by invitation to undertake forward planning, and greater community access and interactivity on Arts Nexus website. Increasingly, these endeavours have worked collaboratively with partnering agencies. During this phase Arts Nexus actively participated in development of the first Queensland Creative Industries Strategy, adopted by State Development in 2004, so extending the scope of activities from arts and culture as an agent of social change to also facilitating greater business sustainability for those working in creative enterprises. Arts Nexus has since hosted the FNQ creative industries cluster, Tropical Creatives, who have recently driven a repeat of the baseline economic study of FNQ creative industries that Arts Nexus originally commissioned in 1996. Economist Bill Cummings shows that turnover has doubled in a decade, with the industry worth $280m, greater than sugar at $240m and Fishing at $180-200m. Creative Industries is poorly recognised by those that see business as traditional edifice enterprises, not people with IP that can be commercialised. In all its work, Arts Nexus recognises that at the core of intuitive and high order learning, innovation and creativity, is the free flow of information and ideas between people and organisations, reliant on the currency of networks, and the quality of relationships. Arts Nexus has been a key driver in building an identifiable creative sector of some depth for the region over the past decade through such internal sector development that still continue. That is, through communication services, skills development, business development and sector building. Phase Three from 2007, while retaining existing services, sees more emphasis being placed on becoming more outward looking. There is now a need to foster greater participation in creativity and in cultural life across the regional community. This is to foster a more creative community, build audiences and thus sustainability for the region’s producers. Domestically, this will include working collaboratively cross-sector. It will also involve projecting the region’s cultural output and profile beyond the region both nationally and internationally, through tourism, and the beginnings of export from the region. All phases have the underpinning theme of contributing to a cohesive society, its sense of identity and community well-being.